Yes, coke can very easily become addictive. We review how you get addicted to coke and how to avoid coke addiction here. Yes, coke is a highly addictive and extremely dangerous drug. While getting high on cocaine only lasts for 30 minutes or less, cocaine stays in the system from 2-4 days after use. Plus, using the drug causes long term changes to the brain and body. Its stimulant effects can cause severe reactions that can result in death or hospitalization. So how do drugs change brain chemistry and when cocaine affects the brain, why is it so addictive? What are the health effects of long-term coke use? Why is coke addiction so difficult to kick, and what treatments are available to help coke addicts go sober? We’ll look at each of these questions here. Coke is a powerful, addictive stimulant drug that comes in several forms. Cocaine is derived from the coca plant, which is native to South America. The leaves are processed to create purified coke, which is much stronger than the natural variety. This street drug is often diluted with harmless substances like cornstarch, talcum powder, or sugar, and sometimes it is combined with other drugs like heroin, procaine, and amphetamine. These combinations of other drugs with coke can be especially dangerous. Cocaine can come powdered and is either snorted or dissolved in water and injected intravenously. “Crack” cocaine is the form that has been processed into a hard rock crystal, which is heated to release vapors that are then smoked. All three methods will release coke directly into the bloodstream. What does coke do in the body? Once cocaine enters the bloodstream, it finds its way to the brain. The faster it can reach the brain, the more intense the high that the user experiences. But how does cocaine affect the brain? Coke affects the central nervous system by increasing the amount of dopamine in the brain. Dopamine is normally released in response to some sort of pleasurable outside signal, such as the smell of a delicious meal – but is then recycled back into the brain after a short time. Cocaine prevents dopamine from being reabsorbed by the brain, causing it to build up in excessive amounts. This is what causes the feeling of euphoria which can make coke so addictive. How do you get addicted to coke? Not everyone who uses coke becomes a coke addict. Some people are able to use cocaine on an occasional basis – although coke is never a safe drug in any amount. People become addicted when they start to develop a tolerance to the drug and have to take higher and higher doses to experience the initial high. They may also take the drug in repeated doses over a short period of time, which also greatly increases the risk of developing an addiction. Who gets addicted to coke? People from all walks of life can become addicted to coke. A 2008 study by the National Survey on Drug use and Health found that there were nearly 1.9 million people in the US who’d taken cocaine within the past month – 359,000 of which smoked crack cocaine. Most users of the drug are between the ages of 18-25. However, men are more likely to be coke addicts than women. Depending on how the drug is taken, cocaine can have different long-term health effects. People who snort cocaine can lose their sense of smell or experience frequent nosebleeds. Ingesting coke can actually cause gangrene of the bowel. Injecting coke can result in fatal or severe allergic reactions to the drug or street additives, and increases a person’s risk of contracting HIV and Hepatitis A and B. 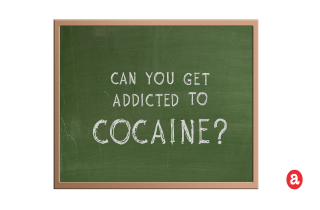 In general, cocaine use causes a loss of appetite, severe weight loss, and malnourishment. It’s impossible to predict who will become addicted to coke and who will not. Some people only use cocaine once and never crave it again. Others will experience intense and uncontrollable cravings for the drug after first use. Even addicts who have long periods of abstinence from the drug are likely to relapse suddenly. Are you addicted to Ccke? If you’re addicted to cocaine, there are treatments available to help you. While there are currently no FDA-approved medications to treat coke addiction, some medications used for other diseases are showing promising results. Behavioral interventions and therapies are currently the most widely available and effective treatments for coke addiction. This might include cognitive-behavioral therapy, or living temporarily in a therapeutic community. There are also numerous community-based programs and support groups that can help, such as Cocaine Anonymous. Please leave us your questions and comments about cocaine use, abuse and addiction here. We try to answer all legitimate questions with a personal and prompt response. If we don’t know the answer to your question, we will point you in the right direction to someone who does. Hello I have a question I was a fromer user I’m 26 and I was a user for about 3 years, I would snort a lot from my left nostril and it made a very tiny like extremely tiny hole or so I think it did I think it did only because it feels like it did and I always get a dry patchy skin and it itches inside my nose so much that i pick it, so what has happened that after all this time it never has heal so I notice each time I mess around with that area my left ear hurts like almost like an ear infection, is there anyway that maybe I’m touching a nerve in my nose or something ? Also I’m not addicted or I would like to think that I’m not, just because I been clean for about two years and only have used once this year, but I have recently had an urge to start again : ( it helps to at least to speak about it at least here because this forum is about other focus dealing with the same situation any advice would really help! Hi Ruthie. The prolonged use of coke administered by snorting may be connected with your nostril problems, but you should probably see a doctor about your nose and ear problems, so s/he can determine the reasons. The urges to start again can be hard to manage, and you need to make a strategy in order to avoid using again. Do something that you like in order to stop thinking about it. Also, you may try practicing meditation and yoga, or enroll into a support group. Also, you can talk with a therapist. I am A long term “functioning addict”. I am on 75 mg of methadone maintenance. My drug of choice has always been cocaine. For over 25 years. I’m 56 yrs old. I am a daughter, mother, grandmother, caretaker for my father who has dementia..and I am tired..the cravings are overwhelming, or perhaps I have no self control..I want to stop both methadone and coke, I have Medicaid yet no hospital/rehab will accept me due to not being ” medically necessary”. Is there hope for me? I am so tired .. Call the Cocaine Helpline listed here on 1-888-497-6879 to get in touch with dependable hotline professionals available 24/7. You will be talking to someone knowledgeable about cocaine abuse, rehab and recovery centers who can help you find a cocaine recovery program. Can you get addicted to DXM?